I'm sure I'll have practically flooded this section with tidbits about new Radeon HD 7990 graphics cards by tonight. Still, as tedious as it is to report on the arrival of each new video card box, I may as well get it over it, especially since it's not all that often that a high-profile product like this appears. 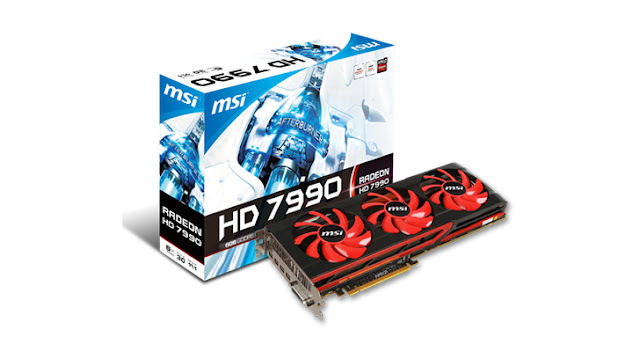 Much like Club 3D, ASUS and Origin PC have done, Micro-Star International has revealed its own-brand Radeon HD 7990. Bearing the part number of R7990-6GD5, it has all the features I have described, and, of course, ships with download codes for eight games. Later this year, when and if AMD allows its partners to modify the PCB and cooling, we may see an actually unique MSI iteration of the adapter. Until then, logo stickers will have to do.